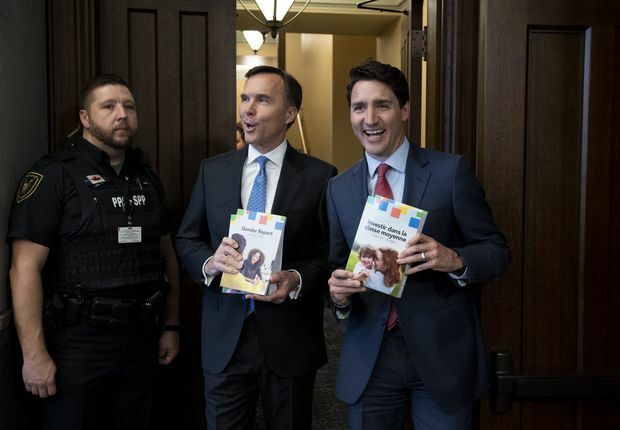 Prime Minister Justin Trudeau and Minister of Finance Bill Morneau arrive in the Foyer of the House of Commons to table the Budget, on Parliament Hill in Ottawa on March 19, 2019. In an effort to lay the groundwork for a national pharmacare program, Ottawa is promising to create a new drug agency and eventually to spend as much as $500-million a year paying for expensive medicine for rare diseases. But the commitments in the Liberals’ pre-election budget fall far short of the comprehensive plan that pharmacare boosters hope to see debated on the campaign trail in October. The budget allocates $35-million over four years, beginning in 2019-2020, toward setting up a transition office for the Canadian Drug Agency, a new organization that would manage the country’s first-ever national formulary – a centralized list of drugs covered for everyone, regardless of their ability to pay. The new agency would also lead pricing negotiations with drug makers and conduct health technology assessments evaluating the efficacy and cost-effectiveness of new pharmaceuticals, two functions already performed by other players in the health-care system. Michael Law, a University of British Columbia professor who holds the Canada Research Chair in Access to Medicines, said it makes sense to bring those tasks under one roof, especially if the government wants to reduce Canada’s drug prices and per-capita drug spending, which are among the highest in the world. Despite that, an estimated one in five Canadians is either uninsured or underinsured. Paying for rare-disease drugs, also known as orphan drugs, has become a major flashpoint in the pharmacare debate. Canada does not have a national strategy for dealing with high-cost drugs taken by a small number of Canadians, despite the financial pressure those treatments are putting on government and employer-sponsored drug plans. All but two of the new non-cancer medications cost more than $10,000 a year, and several cost more than $100,000 a year, according to a report released last month by the federal drug-pricing regulator. The lack of a coherent national policy also hurts patients with rare and often devastating diseases, some of whom have to move to a different province to garner public funding for the drugs they need. In their budget, the Liberals vowed to implement a national strategy for rare-disease drugs, and to allocate up to $1-billion over two years, beginning in 2022-2023, to help foot the bill for the super-expensive medications. The budget also floats a possible $500-million in funding for that purpose every year thereafter. Establishing a new drug agency was one of the key recommendations in an interim report released earlier this month by the Advisory Council on the Implementation of National Pharmacare, an expert panel that Finance Minister Bill Morneau announced in last year’s budget. The report also flagged the challenges posed by expensive drugs for rare diseases. The federal budget includes new spending in a range of areas including support for first-time homebuyers, ensuring seniors are enrolled in CPP and the further advancement of reconciliation. The seven-member panel, led by former Ontario health minister Eric Hoskins, is expected to release final recommendations by the end of spring for overhauling Canada’s fractured approach to paying for prescription drugs. The council could endorse a universal, single-payer system that does for drugs what Medicare did for hospital and physician care, or it could advocate for something more modest that would fill the gaps in the existing private-public insurance system. Reports favouring some form of national pharmacare for Canada have been piling up since the middle of the past century. One of the most recent came from the Liberal-dominated parliamentary committee on health, which last April endorsed a universal single-payer system and suggested the Canada Health Act be expanded to cover prescription drugs dispensed outside of hospitals. Women’s College’s Dr. Martin, a family physician who delivered an address about pharmacare at a Liberal convention last year, said she hopes the government will embrace a universal, comprehensive single-payer system and run on it in the fall, after the advisory council’s report is published.